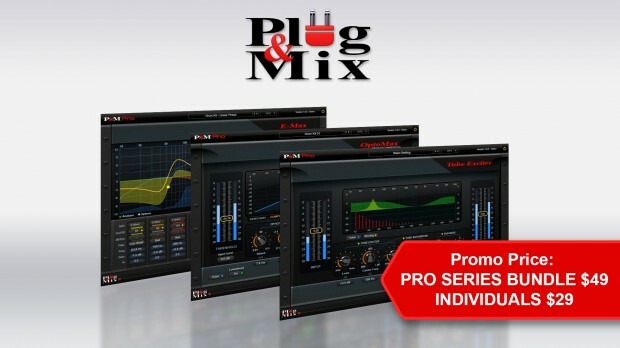 From today until the end of September the Plug & Mix Pro Series Bundle is on promo at a price of $49, and each individual product: E-Max, OptoMax and Tube Exciter that make up the bundle are also on promo at only $29. That makes these audio tools affordable for anyone who wants their mixes to have the most professional sound possible. These are the Plug-ins designed and used by Pros. Plug & Mix’s collection called the Ultimate Precision “Pro Series” plug-ins were designed to reflect the need and requests of P&M’s most demanding professional customers that wanted more control and finesse in the plug-ins they use in their daily tasks. The “Pro Series” plug-ins contains three plug-ins that have been designed to reflect the need and requests of P&M’s most demanding professional customers for their daily tasks. P&M OptoMax is a state of the art plug-in for use in your favorite digital audio workstation. P&M OptoMax is designed to give you precision dynamic control over any type of media whether its vocals, drums or entire compositions. P&M Tube Exciter delivers punch, clarity and sparkle to any signal you run through it. The plug-in features Tube Exciter, Tube Saturation and Sub Bass enhancers which can enrich your sound in subtle or drastic ways. This entry was posted in DontCrack, Plug & Mix, Plug-ins, Promotions and tagged Compressor, E-Max, Equaliser, Exciter, Harmonic Exciter, OptoMax, Plug & Mix, Pro Series, Pro Series Bundle, Tube Exciter. Bookmark the permalink.